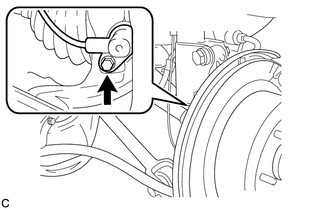 (a) Remove the bolt and separate the rear speed sensor from the rear axle carrier sub-assembly. Keep the sensor tip and rear speed sensor installation hole free of foreign matter. (a) Put matchmarks on the rear drive shaft assembly and rear axle hub and bearing assembly. Do not punch the matchmarks. 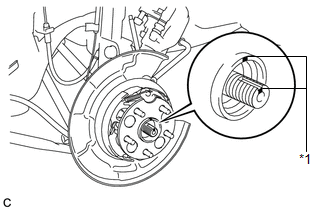 (b) Using a plastic hammer, separate the rear drive shaft assembly from the axle hub and bearing assembly. If it is difficult to separate, tap the end of the rear drive shaft assembly using a brass bar and a hammer. 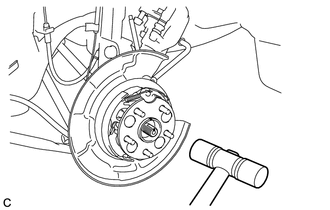 (c) Remove the 4 bolts and the rear axle hub and bearing assembly. 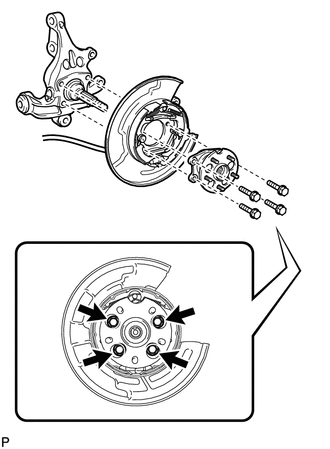 Do not rotate the rear drive shaft with the rear axle hub and bearing assembly removed.